Whipped Cream. 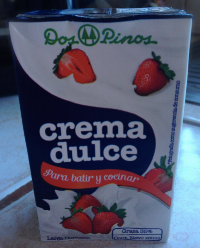 For this, you’ll want the crema dulce stored in the refrigerator so it is very cold. Also put your mixer bowl and beaters in the freezer for 30 minutes beforehand. Take your box of cold crema dulce, shake it (if you can – it will be thick), flip up the top and bottom corners (makes the box bigger) and squish it around. Cut off the very top part and squeeze the contents into your mixer bowl. I usually squish the box from the bottom while squeezing it out (like when you’re trying to get that last bit of toothpaste out of the tube). You can also use a rubber spatula to scrape every last morsel out of the box. The contents may be part liquid, and part solid – don’t worry! Just start your mixer, and then put it on a higher speed until it forms into a thick whipped cream. Remember not to whip TOO long or you will have butter! Add a little vanilla and powdered sugar to taste. .